The Bouvier des Flandres or "Cattle Dog of Flanders" originated in the low-lying areas of what is now Belgium and Holland. It is virtually impossible to pinpoint the breed's exact origins, but it probably evolved from the hardiest farm and country dogs. Modernisation of farm equipment has put a stop to the Bouvier’s original use as a working dog and nowadays serves principally as a guardian of farm and family or, in some countries, as a working service dog for the Police and Defence forces. 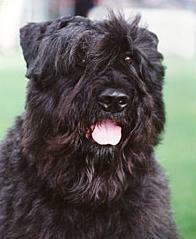 The Bouvier des Flandres has a dominant nature and likes to be "top dog" in the home. Bouvier puppies adapt well to older dogs or cats in the home, but older Bouviers can be more difficult to integrate into a new home with existing pets. Bringing a new dog into the home after your Bouvier has ruled the roost for some time may lead to conflict, but careful obedience training will soon control this behaviour.